Home › Subjects › Chemistry › Organic Chemistry › Alkanes: Did you know? You have seen people using petrol in cars and you must have used Vaseline1 or some other petroleum jelly. Both of these are derived from crude oil or petroleum and they both contain different forms of alkanes. Methane is the simplest form of alkane. 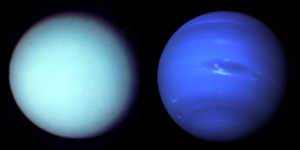 It is present in the atmospheres of Uranus2 and Neptune3. Methane absorbs at near infrared or visible range of electromagnetic spectrum and emits the complimentary blue color. The cooking gas that we use in the kitchen contains alkanes more specifically, propane and butane4 and marsh gas, which burns with a blue flame, is also an alkane (more specifically, methane). Watch this video to see how marsh gas looks like while burning. A branched alkane called pristane is found in shark liver oil5 and cockroach pheromone have undecane6, a linear alkane.